County crews worked to scrub graffiti off the Confederate Soldiers Monument in Denton Square Monday morning after workers arrived and found it vandalized. 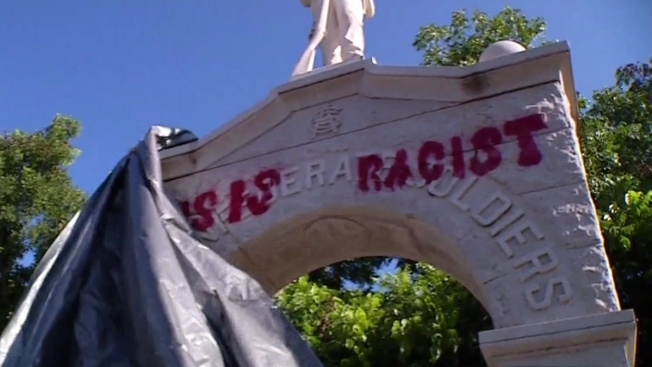 Someone spray-painted "This is racist" on the monument outside the Denton County Courthouse overnight. Surveillance video released by the Denton County Sheriff’s office to NBC 5 shows two people at about 4:30 a.m. Monday run up to the statue, with what look like large stencils. Then they appear to climb onto the statue, paint the words and then run off on foot to the west of the Courthouse Square. The camera shooting the video was placed in a window inside the courthouse due to the possibility of something like this happening. The monument had been subject to another debate recently, as many pushed to have it removed. Some see it as a symbol of racism, while others say it’s a monument to Denton’s fallen soldiers and not the Confederacy. County leaders said defacing public property, especially a federally-protected monument, could lead to very serious consequences and could bring felony charges if the suspects are caught. The sheriff’s department continues to look for leads and asks anyone with any information that could help to contact Denton County Crime Stoppers at 1-800-388-TIPS.